I’m listening to the White Album. For the under 50-somethings out there, it was a seminal album in 1968 by this pop group from England, The Beatles. It mixed some great, important music, with some foolishness, which emphasized the immense popularity of the Beatles at the time. It always reminds me of listening to it being played for the first time on AM radio, one album side at a time, uninterrupted. Three weeks before it was released! Unheard of in 1968. And I’m crossing the Throgs Neck Bridge to spend the night at SUNY Stony Brook with my then girlfriend, the beautiful Ellen Blevins. I had spent the day riding motorcycles with my BFF, Craig Lassen. Months before, Craig handed his Triumph Bonneville over to me, showed me the controls and said “go have fun, don’t come back for 2 hours, you’ll know how to ride by then”. No helmet law, no motorcycle license requirement, just a lot of caution on my part. So who was this Craig Lassen? Like me he grew up in a working-class family. We both went to Tappan Zee High School. We both were on the baseball team,(I pitched, he was a catcher). He was not terribly Catholic, I was not terribly Jewish. We both went to RPI in Troy, NY. We were in some ways so similar, in others so different. I was on a track to be a physicist (which I would never have been any good at, at all), Craig just dreamed about living. He wanted to go out to Montana and just sit on a mountain and look around. We never got to Montana that previous summer, but just talking about was like the first bit of light seeping out of an opening door for me. New possibilities, unprescribed by the past. He opened up my thinking about life. His influence broadened me in ways I didn’t realize for years. 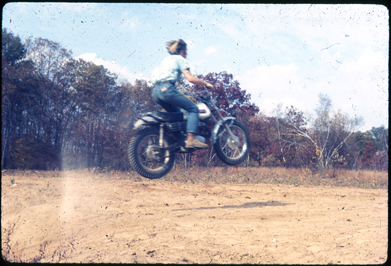 So I think back to Craig and a motorcycle mechanic, “Bultaco” Barney, and thank them for turning me into a photographer. I jumped track, so to speak, and decided to do something I loved. They gave me the advice and the courage to try. It was the same message that Steve Jobs gave people. Back to my passionate night with Ellen. At 7:00 in the morning, my parents called to tell me that Craig had drowned the night before. My other close friend, Jonathon Adams drowned with him, in 6 feet of cold Hudson River water. I think of Craig and Jonathon often, and I thank Craig for having been the best friend I would ever have. I was never able to see Ellen again. Guilt is a funny, and powerful thing. This entry was posted on Thursday, October 13th, 2011 at 8:42 PM	and posted in Uncategorized. You can follow any responses to this entry through the RSS 2.0 feed. that is so beautiful and sad. I wish I had known Craig. Not Ellen. Thanks for telling this story, I believe it’s important to do so. You were lucky to have people like this in your life. Sorry it was so short. I was there, too. I even have a photo of you on your DT-3 looking like you knew what you were doing. We damn near killed ourselves on that Honda. Young and dumb made us invincible, almost. November second is my birthday and, unfortunately, I remember the phone call before they went canoeing in the full moon like it was yesterday. People only leave if you forget them. Craig was a best friend and Jonathan was my brother. Glad to see my other friend feels the same.